Campaign Against Arms Trade’s Rachel Melly exposes the British state’s complicity in the global arms trade. This time last month a video of a waddling horde of security guards chasing a grim reaper to the tune of Benny Hill went viral. My friends and I watched it and had a good laugh, but a look into the source of the video revealed something more sinister. The man dressed as a grim reaper was protesting against the world’s largest arms fair, where over 1000 arms dealers showcased their wares and made deadly deals with 30,000 buyers from around the world. A number of government and military representatives known to be committing human rights abuses or killing civilians in war were there, including from Saudi Arabia, United Arab Emirates, Iraq and Turkey. Israel had a “pavilion” where they marketed their “battle tested” weapons. These were not dark, seedy, illegal deals happening in a creepy warehouse somewhere far from home; this was a formal, official affair with suits and champagne, in the centre of London. What I found most shocking about it is that it had the full support of, and even encouragement from,the UK government. That particular arms fair took place this September, but the government’s role in arming oppressive regimes runs deeper than this single event. Arms companies make weapons, tanks, armoured vehicles and other artillery, and then sell them for profit to anyone who will buy. But it’s the government who licence the sales and spend tax payers’ money on arms research and promoting arms sales around the world. 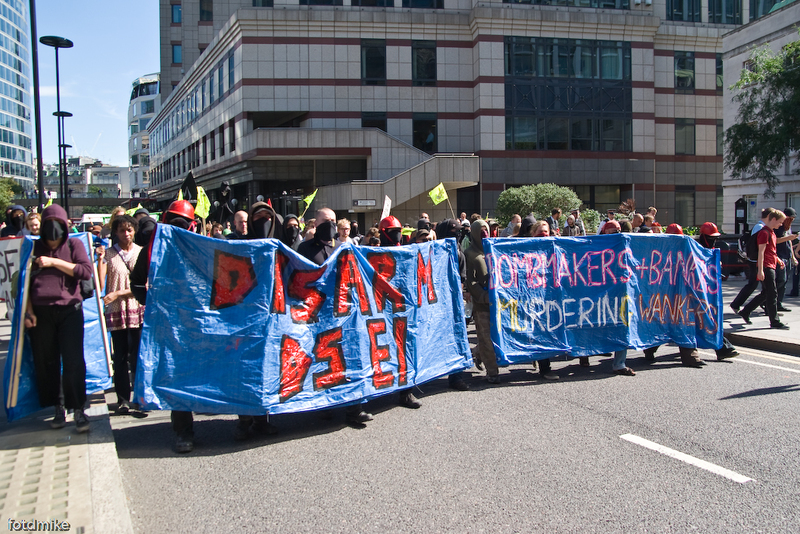 One estimate from the Stockholm International Peace Research Institute suggests that the UK government subsidises the arms trade by £700 million every single year, whilst claiming there is no money in the pot for essential services. The UK arms industry is currently supporting conflict around the world; British made bombs are killing civilians in Yemen, British made drones are targeting civilians in Palestine, and Britain is supplying Turkey during its attack on Kurdish people. The UK government calls the industry the “defence industry” and justifies its support by saying that everybody has the right to defence. But up to 90% of the casualties of war are defenceless civilians. Of the conflicts around the world, the UK government is arming Turkey but not the Kurds, Israel but not Palestinians, Saudi Arabia but not the people being suppressed and abused. Saudi Arabia is the UK’s largest buyer of arms, and the UK, in turn, is Saudi Arabia’s largest supplier of arms. £4 billion worth of UK arms were sold to Saudi Arabia under the coalition government. The UK government is heavily involved as most of the deals are government-to-government contracts. Saudi Arabia is one of the most authoritarian, undemocratic regimes in the world. The Saudi authorities bomb civilians, sentence bloggers to lashings, crucify peaceful pro-democracy protesters, and some reports suggest they behead more people than Daesh. There is evidence that UK made arms have been used by the Saudi regime many times to inflict human rights abuses, yet the UK government continues to regard it as a “priority market” for British made weapons. How does the government justify its ever-closer relationship with the Saudi regime? In September MPs in Westminster Hall voiced their disapproval for the UK’s complicity in Saudi Arabia’s crimes. The Foreign and Commonwealth Office responded to the criticism by claiming that the sales of billions of pounds worth of arms to Saudi Arabia fosters a friendly relationship that allows the UK government to pressure Saudi Arabia to improve its human rights practices. Yet it recently transpired that dodgy arrangements have been made between the UK and Saudi governments to get Saudi Arabia onto the UN’s Human Rights Council, a huge show of support and acceptance for Saudi Arabia’s current regime. Saudi Arabia isn’t the only controversial buyer of UK arms; Iraq, Bahrain, Turkey, United Arab Emirates and Israel are also large buyers. Israel purchases tens of millions of pounds worth of UK weapons, some of which have been used against civilians in Palestine as part of its continued illegal occupation. Israel has repeatedly been accused of war crimes. The occupation has caused the deaths of thousands of Palestinian people, including children, and seriously limits people’s access to essential food, medicine and building supplies. Arms used by Israel to terrorise Palestinians, including guns, fighter jets, naval vessels and armoured personnel, have all contained components manufactured and sold by the UK. These sorts of selling practices are not anomalies or mistakes: they are common practice. The UK is complicit in war crimes and human rights abuses across the world, while preaching about human rights and democracy. The hypocrisy is sickening, but perhaps the grim reaper with a comical run will draw our attention to it. After studying Physics at the University of York, Rachel Melly has become the Universities Network Coordinator for Campaign Against Arms Trade (CAAT). She works to support students and staff at higher education institutions who want to break ties between their university and the arms trade, and can be contacted at rachel.melly@caat.org.uk.